The television grave excavating continues, as a quartet of space misfits slash adventurers make a comeback for more wacky escapades. 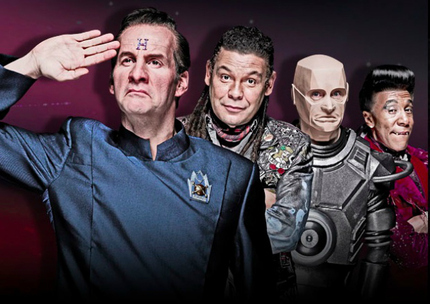 The rumor about the resurrection of the cult British sci-fi sitcom Red Dwarf had been making the rounds this past May, although it might have gotten possibly drowned out by the royal labour pains. A more recent report clarified what, exactly, is being planned. The utterly incompatible crew, consisting of a lazy pathological curry devourer, a holographic sack of neurosis, an irritatingly servile droid, and the humanoid embodiment of narcissism made it from late 80s through 90s and got teleported right into the new millennium. Similarly to Arrested Development, Red Dwarf returned under a new flag, UKTV's Dave channel. And people at Dave cannot get enough of boys from the Dwarf. After a three-episode miniseries Red Dwarf: Back to Earth (2009) and six new episodes in season X (2012), netting the Royal Television Society Award, two more seasons are currently in the oven. In accord with the show's humor, season IX has been intentionally omitted after the knee-to-sack cliffhanger, to be fulfilled by viewers fantasies and fan fiction scribblers, with Doug Naylor adding that season X will make more sense in the future. Craig Charles, portraying slacker Dave Lister, who is his own father and coincidentally the last living human, quit his 10-year-long stint at the soap opera with a deep tradition, Coronation Street (8714 episodes and counting), to fully focus on seasons XI and XII, scheduled to be shot from November 2015 to February 2016. In total, 12 new episodes are on their way, as reported by the show´s co-creator, writer, producer and director, Doug Naylor. Howard Goodall has been confirmed to return and compose original music for the show. The seasons are expected to hit small screens in 2016 and 2017, respectively. Naylor recently revealed the new Red Dwarf shows will be shot in front of a live audience (in Pinewood Studios, Buckinghamshire). Information about tickets for this occasion will be disclosed in early September at Naylor´s Twitter. Until the return of Dave Lister, Arnold Judas Rimmer, Kryten and The Cat and as a cure for sudden nostalgic rushes to the head, the nine out of ten medibots recommend binge-(re)watching the Red Dwarf´s gang exploits. Maybe it's time to let it die. The only reason the show continued after the superb season six, and the loss of Rob Grant, was the long-held hope of doing a feature film. That's what accounted for the baffling changes in subsequent seasons; the attempts to make it less jokey and more 'cinematic' and, most controversially, bringing Kochanski into the show as a full-time cast member. Even Doug Naylor admitted that she was put in the show because the American studios said that if they wanted to make a film they had to have a female character. If they keep going it'll begin to look like DAD'S ARMY.